A 2-storied pagoda that developed from the circular, roofed one called *houtou 宝塔; the only extant houtou are miniature ones. The core of the tahoutou is also circular but, except for the extremely large ones *daitou 大塔, there are no circle of round pillars enclosing the sanctuary. They do not extend to the floor of the first story. In most tahoutou there are two or four circular pillars marking the sanctuary. Like the *amidadou 阿弥陀堂, these do not always line up with the peripheral pillars. Some have *raigoukabe 来迎壁 between the two rear pillars. The four pillars marking the corners of the sanctuary or even if only two pillars are at the rear corners, they are called *shitenbashira 四天柱, symbolic of the four guardian gods of the east, south, west and north, important deities in the Esoteric Buddhist mikkyou 密教. Some tahoutou have no structural parts on the interior. Its upper part rises outside above the enclosed pent roof *mokoshi 裳階. Its bun-shaped form *kamebara 亀腹, is covered with white plaster *shikkui 漆喰, as is the mound that is also called kamebara located under the veranda and floor of the first story. No extant tahoutou are built at floor level on stone podii. 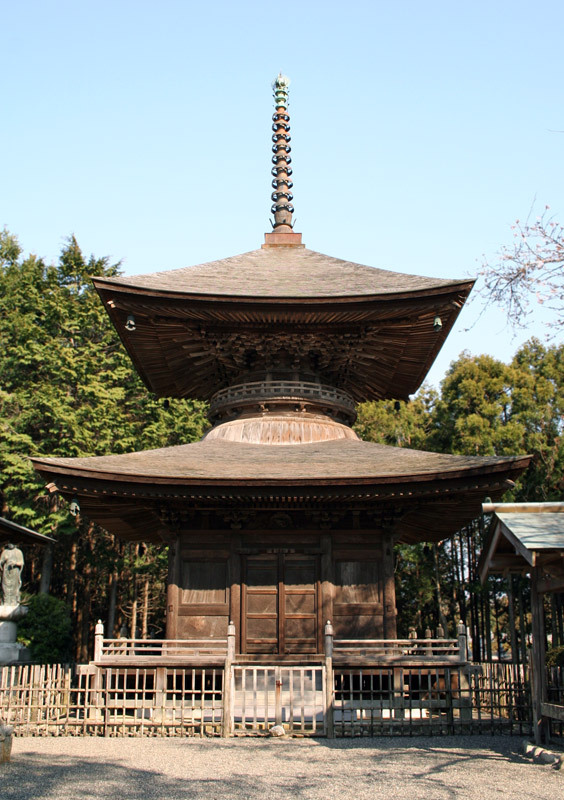 However, the Kontaiji Tahoutou 金胎寺多宝塔 (1298) in Kyoto, is erected on top of what appears to be an ancient stone podium. The veranda and flooring are supported by circular struts *tsuka 束, placed on top of the podium. There is no kamebara underneath. 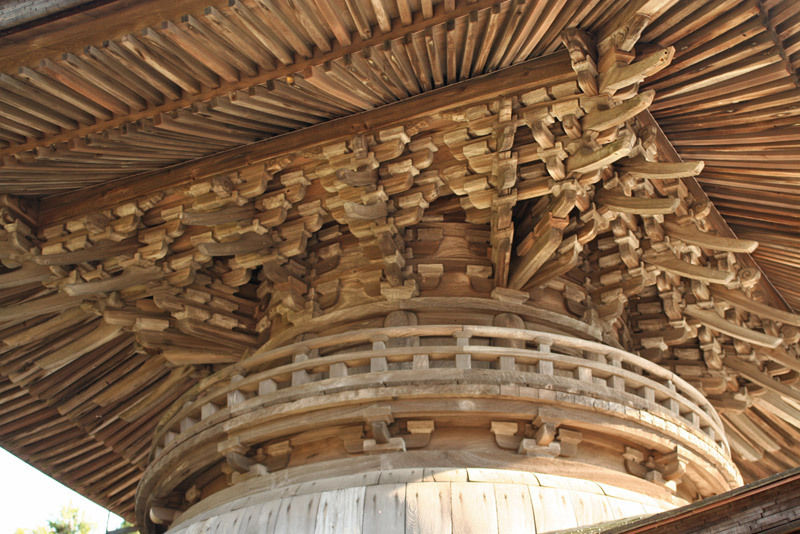 It is the oldest example of round pillars used for constructing the mokoshi in existence. The first story of all tahoutou is a square 3×3 bay structure varying in dimension from 0.63m at Anrakuji 安楽寺 (14c) in Wakayama prefecture, to the largest, 20.5m at Joudoji 浄土寺 (1329) in Hiroshima prefecture. From the earliest extant Tahoutou at Ishiyamadera 石山寺 (1194) in Shiga prefecture to those constructed in the Momoyama period, the number of tahoutou with chamfered square pillars on the first story decreased noticeably in proportion to the increase in the use of circular pillars, particularly from the Muromachi period. In the earlier periods, bracket complexes used stop the square pillars or in rare instances of circular pillars, were the simple 3-on-1 type *mitsudo tokyou 三斗斗きょう. When circular pillars superseded the use of square ones, 1-stepped bracket complexes *demitsudo 出三斗, or 2-stepped *futatesakigumi 二手先組, were employed atop the pillars to extend the supporting strength for the pent roof. On top of white bun-shaped kamebara there was a circular railing most often supported by unstepped bracket complexes. 4-stepped brackets *yotesaki tokyou 四手先斗きょう, support the deeply extended eaves *noki 軒. In no other type of building has the consistent used of 4-stepped bracket complexes prevailed. Most of the bracket complexes are wayou style *wayou 和様, but exceptions where Zen style complexes that can be seen at Houdouji 法道寺 Tahoutou (1368) in Osaka; Mitsuzouin 密蔵院 Tahoutou (Muromachi period), Toukannonji 東観音寺 Tahoutou (1528), Kannonji 観音寺 Tahoutou (1536), all in Aichi prefecture ; Shouman-in 勝鬘院 Tahoutou (1597) in Osaka. A finial *sourin 相輪, crowns the peak of the pyramidal roof in all tahoutou. It is composed of the square cover *roban 露盤, the inverted bowl *fukubachi 伏鉢, one or more rings of lotus petals *ukebana 受花, nine metal rings *kurin 九輪, attached to the metal sheathing around the wooden core of the spire and the tear-drop shaped jewel *houju 宝珠, at the top. Neither the dragon vehicle *ryuusha 竜車, nor the fire and water symbols *suien 水煙, found as an integral part of *sourin 相輪 on ordinary 3-storied or 5-storied pagodas, are included in the sourin of tahoutou. The tahoutou is a form of pagoda favored by esoteric sects and was originally dedicated to Tahou nyorai 多宝如来 (Sk: Prabhutaratna). Images of Tahou nyorai and Shaka nyorai 釈迦如来 (Sk: Sakyamuni, *Shaka 釈迦) may be placed within the tahoutou and be the focal point of worship. Thus the tahoutou is not a religuary pagoda.